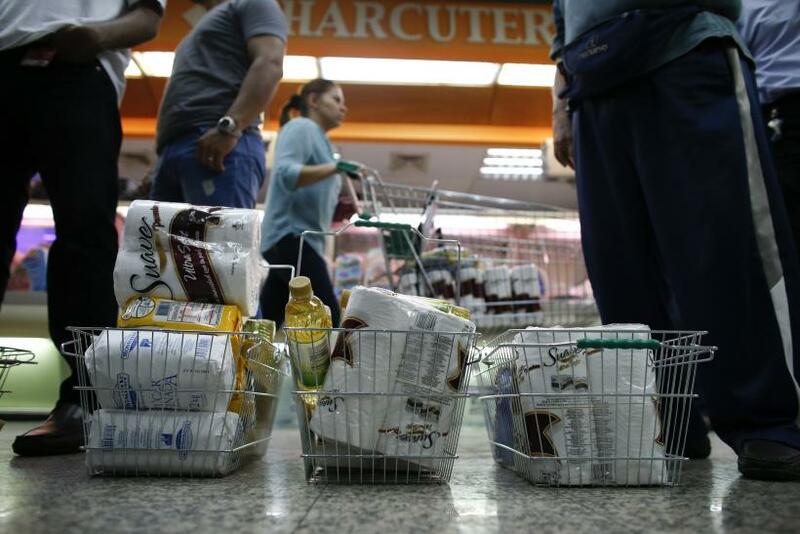 People wait in line for toilet paper in Caracas. Earlier this month, in another attempt to ensure “happiness for all people,” Maduro began to hand out Christmas bonuses, in preparation for the coming elections in December. But political campaigning is not the only reason for the government’s open-handedness. The annual inflation rate in Venezuela has been rapidly rising in recent months, and has now reached a staggering 54 percent (not accounting for possible under-estimations). Although not yet officially in hyper-inflation, monetary expansion is pushing Venezuela toward the brink. As we speak, Venezuelan shoppers are queuing outside seized stores trying to spend their rapidly depreciating currency, and the economy is marching steadily toward a dénouement when bolivars [Venezuela’s currency] will be useful for little more than kindling. Venezuela has in fact been fueling the fire of economic disaster for quite some time. The socialist programs of Chávez’s administration squandered the country’s scarce capital in wasteful production. As chronic shortages set in, the government turned to price, capital, and foreign exchange controls to keep the economy afloat, each of which led to further chaos. Currently, Maduro’s administration is planning to extend the controls to all commodity prices, in yet another doomed effort to fix the country’s dire economic problems, but new controls will only make things worse. The only way to truly prevent soaring prices is to stop the printing press and give the reigns of the economy over to the market by eliminating price controls. The nationalization of private businesses and establishment of total price controls will not cover up disastrous monetary policies, but only prolong and aggravate their effects. They merely add to ever-higher price increases and ever-lower supply of consumer goods and more capital consumption, further eroding the country’s economic foundation. Venezuela’s dire straits might seem far removed from the problems faced by other nations, and it is easy to believe that hyperinflation is impossible “here.” Yet as von Mises warned, the seeds of disaster are sown from the beginning of government intervention in the market, although “the first stage of the inflationary process may last for many years.” But the final stages of economic collapse occur far more quickly: as Peruvian-Spanish writer and political commentator o Alvaro Vargas Llosa points out, “going from 60 percent [inflation] to 1,000 percent is a lot easier than going from 3 percent to 40 or 50 percent.” As disturbing as the thought is, the difference between the U.S. and other Western economies and Venezuela is merely one of degree, not of kind. Venezuela’s problems are more easily visible and have escalated more quickly because its capital stock has been largely depleted by an unbridled 15-year-long commitment to socialist economic policies. Other states such as the US still rely on large capital stocks accumulated in years of freer markets. Therefore, Western economies may not see their toilet paper disappear from supermarket shelves (yet), but rising prices and numerous bankruptcies indicate that the tendency is the same. This cements once again von Mises’s idea that no country will find a stable “middle-of-the-road” economic policy. All movements lead toward one extreme: markets or socialism. Mixed economies are just pit-stops in between. The games all central banks play with the purchasing power of money may be more subtle, but they are ultimately just as harmful as conspicuous socialism. Some have argued that the crisis in Venezuela will most likely “undercut Chavismo’s viability” as a political program. Yet the critical issue is not a political one, but the economic fact that Venezuela is frantically squandering its resources, consuming its capital, and impoverishing its people. If Maduro’s policies persist, and if after the seemingly inevitable collapse the legacy of chavistas loses its viability -- ‘vaccinating’ Venezuelans against a return to such destructive regimes -- it will be the only good thing to come out of these tragic events. Matt McCaffrey is a post-doctoral fellow teaching economics at the University of Illinois at Springfield, and editor of Libertarian Papers. Carmen Dorobăț is a PhD candidate in economics at the University of Angers, and Instructor at the Bucharest Academy of Economic Studies.